Masako Miki, ''This Could Be the Best Thing That Ever Happened to Her,'' fiberglass, resin and spray paint, with ''This Could Be the Best Thing That Ever Happened to Her (wolves and deer),'' ink on Nepalese paper, in background. The ideas of hybridization and ceaseless adaptation are thoroughly ingrained into contemporary consciousness by the global economy, multiculturalism, and the incessant breakneck pace of life. Masako Miki, a Japanese-American, has made the continual metamorphosis of the self in this world of flux the central theme of her work. The title of her new show, "Ancillary Adaptations," denotes the constant adjustments that we all make in order to achieve equilibrium with our environment. But its implicitly connotes the unvarying core from which these temporary externalities grow. In these ten paintings and three sculptures, that core — for Miki, one of graceful innocence — is symbolized by the deer. Their antlers in particular evoke not only weaponry but trees, the forest, and the mortality-based cycles of growth and decay. 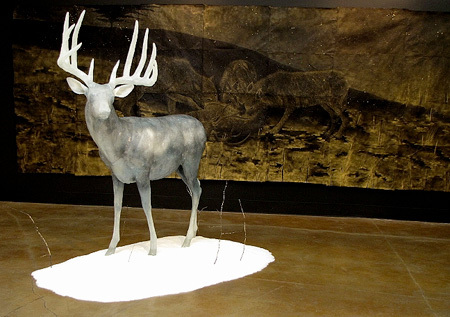 Two wall-mounted sculptures, "Found Crown" and "Growing Antlers Against Her Wish," resemble the trophy racks of antlers displayed in hunt clubs, but Miki has gilded the badge-shaped plaques, and covered the bony branches in velvety white wool, in what could be interpreted as a propitiation to the dead animals. In the paintings on paper, the antlers undergo similar metamorphoses: in "Always Together" a deer standing atop of peak of faceted planes is echoed by its double, or reflection, hanging above, upside down, antlers almost touching; in "Growing Antler Against Her Wish," with its fairy-tale title, the antlers of a dead deer metamorphose into branches in which silhouetted birds come to roost. A mural-sized ink painting on paper, "This Could Be the Best Thing That Ever Happened to Her (wolves and deer)" depicts wolves eating a deer, but without eliciting viewer repulsion — as indicated by the philosophical or ironic title, most of which is used as well for Miki’s life-sized fiberglass deer sculpture, its head and legs whitened to match the snowy base on which it stands, and from which jut small bare antler-like branches or filaments.